TEAM UP WITH ARIZONA FOOTBALL! 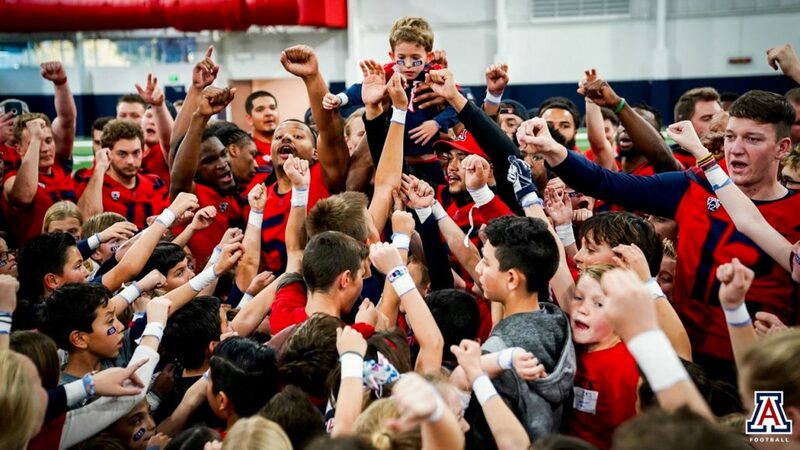 What a phenomenal time everyone had at the 2019 Team Up with Arizona Football event on March 13th! We kicked off the event with our theme for the year… THIS IS ME… which helps us all to remember that we all have our own strengths and weaknesses. We are all brave and we are all bruised. We are all unique and should be celebrated! Coach Sumlin himself then helped our kids get focused and motivated to play! Coach Springer took the reins from there and pumped up all the players… big and small… for some serious football! We are very grateful that UA head football coach Kevin Sumlin and his team of players and coaches see the value in bringing together KOS member kids and patients for an afternoon of fun on the field! We all believe in the importance of honoring patients for their perseverance and positivity and are excited to share in giving back to others with our own Kids of Steele member families. Arizona Football coaches and players again passionately led lucky little players through real team passing, kicking & tackling drills, strength & agility training, and more. We are honored to Team Up with Arizona Football! Special thanks to KOS Photographer Michelle Rooney, who captured most of these incredible moments!